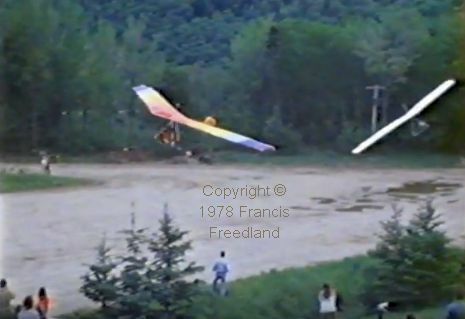 This film is a documentary of a hang gliding competition held in Vermont in 1978. Totalling 48 minutes, it is (in 2015) available on YouTube. 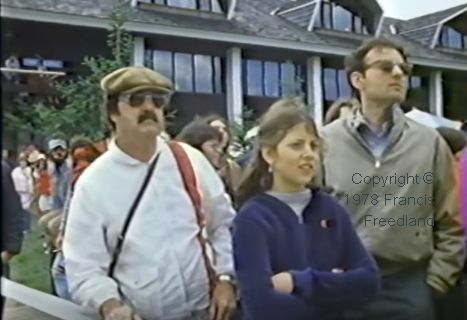 The competition, held at the Pico ski area near Killington, Vermont, featured “90 of the world’s best hang glider pilots” and it drew crowds of spectators who paid to watch from beside the landing area. (Pico rhymes with pike, according to Agent X-Two-Zero the narrator. On the subject of pronunciation, as a reader of the American hang glider magazines, I never really knew how to pronounce Peghiny, Pagen, and some other pilots’ surnames. This film at least provides an opinion on such pronunciations. Jimmy Carter the peanut farmer (and ex submarine commander) was President and, here in Britain, the Prime Minister was ‘Big Jim’ Callaghan. 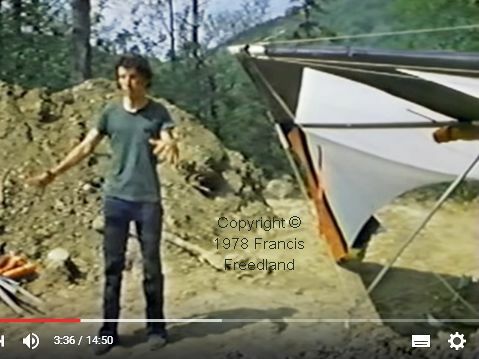 Flared jeans or trousers were the norm, even when flying hang gliders. 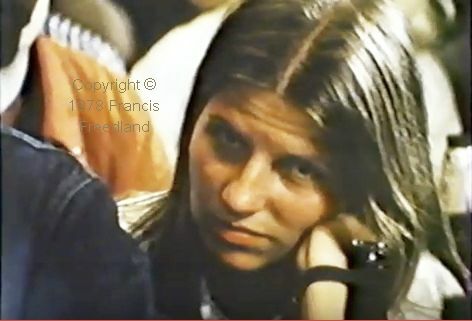 It seems to me that 1978 was only a few years ago. I find it shocking to realise that the young lady in the accompanying screenshot is old enough to be a grandmother by now (2015). Once a pilot, always a pilot. In Britain, we simply assume that all business people are cheats and liars, especially if they are successful business people. I found it interesting to see that, even in the USA, in certain quarters anyway, the same assumption seems to hold. 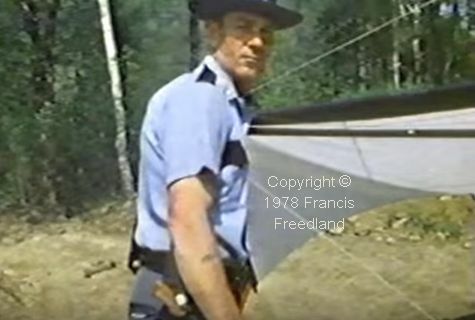 The end of the film includes a summary of a related investigation initiated by a New York schoolteacher, who is also one of the hang glider pilots whose fortunes the film follows. 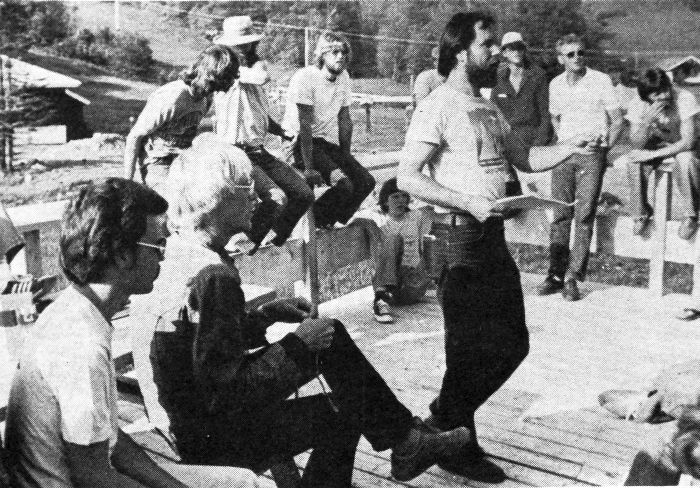 Competition director Don McCabe addresses a pilots’ meeting. Photo by David Fracht in ‘Glider Rider’, July 1978, reprinted courtesy Light Sport and Ultralight Flying magazine. Hang gliders at this time were mostly single surface wings with either flexible plastic or pre-formed aluminium chord-wise battens. Deflexor cables cluttered the leading edges for strength and to keep the lanky tubes from distorting out of shape. Those deflexors created a lot of drag, increased cost of manufacture, and increased the time you spent rigging and de-rigging your wing. 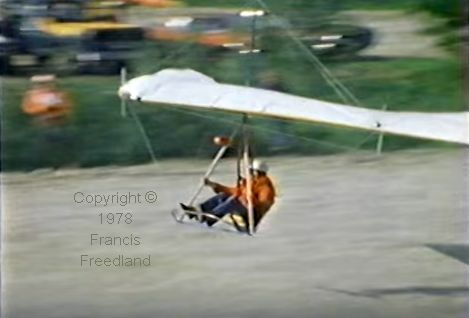 To see Chris’s Sirocco II and his earlier Sirocco 1, visit Flying squad, a short history of the east coast U.S. hang glider manufacturer Sky Sports. Double surface wings enclose the cross-tubes between the upper and lower surfaces of the sail. Not only does that eliminate the aerodynamic drag of the crosstubes, the crosstubes’ contact with the lower surface of the sail improves the washout (wing twist) distribution across the span. Notice the trademark curved leading edges of the Seagull. That is an ingenious way of controlling washout distribution, but the 1978 Seagull was nevertheless a single surface wing with exposed cross-tubes and a bunch of draggy deflexors. Although apparently unremarkable, the UP Comet revolutionised flex-wing hang glider design. Like later single surface wings, the 1980 UP Comet used stronger and stiffer leading edge tubes instead of deflexor systems. For comparison, the Sky Sports Sirocco had eight more drag-inducing wires (as I count) than the UP Comet. 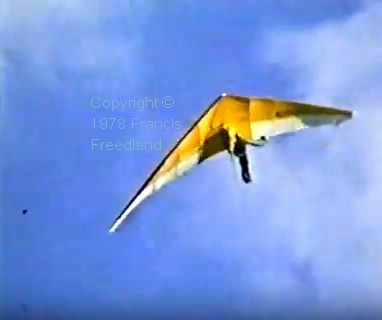 Jean-Michel Bernasconi, a Frenchman visiting the USA as a full time hang glider pilot, is interviewed periodically throughout the film. (He is remarkably cheerful considering his precarious financial position!) He flew one of the early double surface flex-wings, the Phoenix Mariah, which – it was later discovered – suffered from pitch divergence: It would not recover from a steep dive. An addendum to the film follows up Bernasconi a year and a half later. Subsequent to that, he went on to lead Pacific Windcraft (later Pacific Airwave) of California. Then another hang glider crashes into the trees beside the landing area. Neither the pilot involved in that or the previous crash was seriously hurt. The pilots call a meeting and, after they cancel two days’ flying on grounds of safety, the conflict surfaces. Many of these hang glider pilots were in their early 20s (much younger than most hang glider pilots nowadays*) most with little or no business experience, and they are trying to cope with an unfamiliar situation, arguing with experienced business owners, with no guidance from anyone. 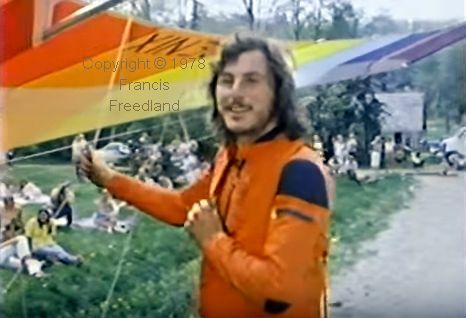 * They are much younger than most hang glider pilots nowadays partly because many are the same individuals, now older. ‘JJ’ LaMarche is another of the pilots that the documentary follows through the competition and beyond. Nevertheless, this part of the film demonstrates that Americans (and, it seems, the French) are more used to organising themselves and arguing their case in public than us Brits. But the sponsors were right in claiming that the fliers had not done their part, too, in flying. Both sides were right. Both sides were angry. In the accompanying screenshot, Bernasconi has deployed a drag chute (much smaller than an emergency parachute). Its purpose is different from that of a military jet airplane’s drag chute, which is for braking after touch-down. A glider’s drag chute is deployed when overhead (or nearly overhead) the landing area, and the pilot then flies extra fast to increase drag still further. The result is a steeper approach than can be made otherwise. A steeper approach is both easier to judge correctly and is less likely to result in an overshoot into spectators (see the film) or into parked vehicles, trees, or buildings. 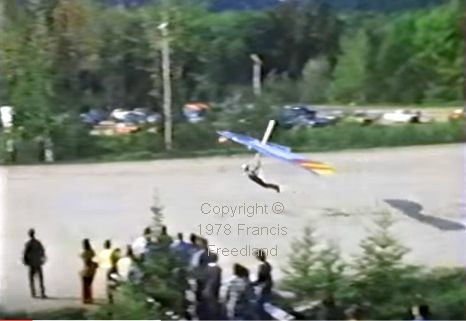 However, hang glider drag chutes embody dangers of their own, as a result of which they are not widely used nowadays. The cheerful Frenchman Bernasconi, whose life’s ambitions centred on winning the competition, led the contest at that point, just beating Peghiny. Unfortunately for them both, conditions then improved, which benefited those who launched later in the day. 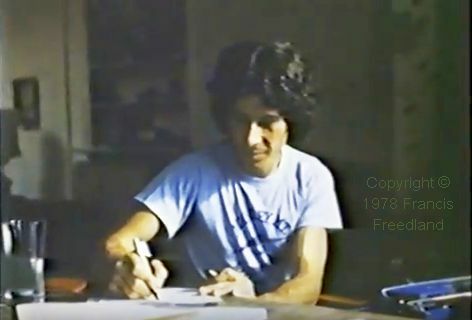 Dennis Pagen, author of the most prominent hang gliding books and authoritative magazine articles to this day, did not win the Pico competition outright, but he became US national champion that year (1978). 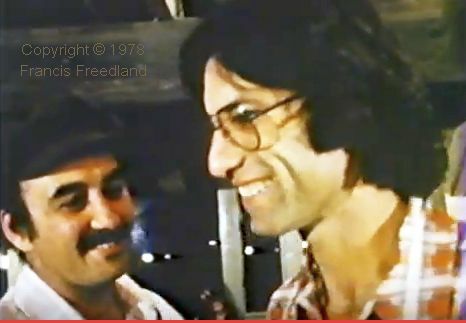 The documentary catches up with Peghiny, LaVersa, LaMarche, and Bernasconi at another hang gliding competition a year and a half later. Even in that short time, some of the hair is shorter and beards are neater, but one of the three has a patch over an eye. Bernasconi achieved his ambitions, although not in the way he initially imagined. 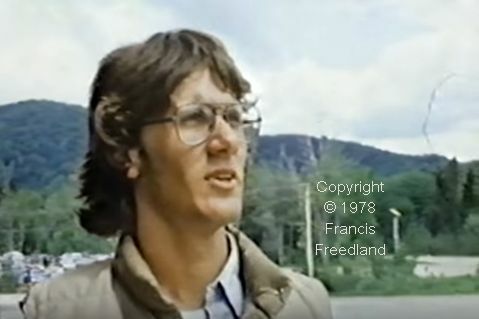 The documentary includes film of two UP Comets taken at the 1980 US nationals in Ellenville, New York, two years later, which is pretty confusing. The camera does not work well in the darkness of a thunderstorm on the hilltop. I doubt that anyone could have done anything about that. Camera technology in 1978 was not what it is today. Some of the incidental music seems to me a bit naff and it includes a girl singing a wobbly song about blackbirds. This film has as its subject a unique event, which it examines in depth. 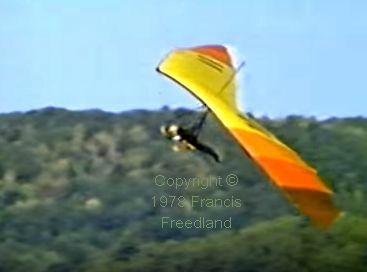 The filming from the ground of airborne hang gliders in this documentary is excellent. The zooming and panning (hopefully I am using the correct terminology) keeps the gliders smoothly in view. In addition, it shows expert pilots landing those hard-to-fly* hang gliders in a restricted landing area, usually successfully. 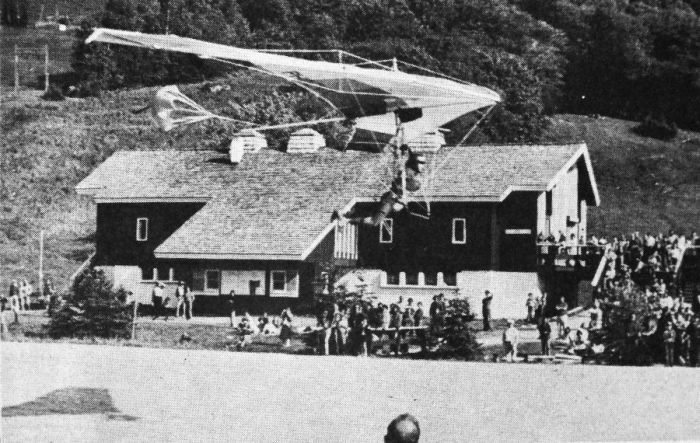 Their landing skills were better than is common nowadays, almost certainly because they made many more landings than we do when flying modern hang gliders, which even in half reasonable conditions can stay up for hours. Even so, some of those gliders, including the Sirocco, seem to touch down as slowly and as light as a feather (given half a chance). * Were they really hard to fly compared to today’s wings? I believe so, if you compare modern beginner and intermediate wings with these old gliders. 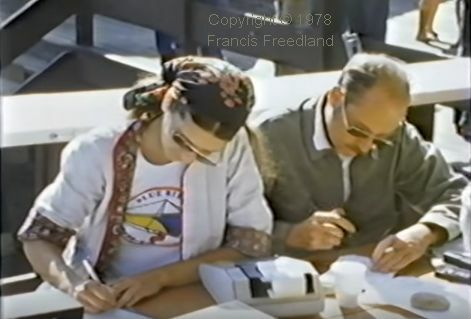 However, as long time instructor Ken DeRussy points out, thousands of pilots learned to fly in standard Rogallos and their early derivatives in the 1970s, so they cannot have been that hard to fly! Phoenix Mariah with drag chute deployed on final at Pico. Photo by David Fracht in ‘Glider Rider’, July 1978, reprinted courtesy Light Sport and Ultralight Flying magazine. Some of the Siroccos are flown supine (seated, like a modern paraglider) and the rigs they use for that are also worth seeing in this extraordinary documentary. Bikini Girl after the comp. Apart from some of the incidental music, the background sound effects are exceptionally well done. Like good writing, you likely don’t notice it unless you are (like me) writing a critique. Birds singing (hey, maybe blackbirds…) followed by the rush of airflow as a hang glider passes close overhead constitute the perfect accompaniment to some of the film. The discussions and conflicts that emerge in the film are, arguably, as engaging as the flying. 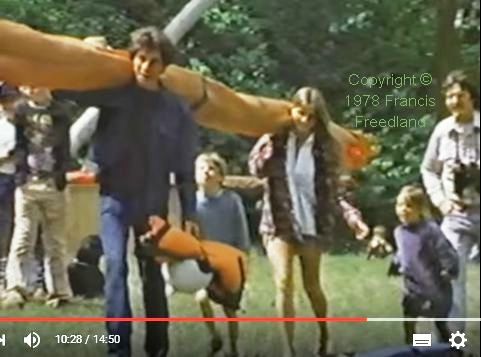 Hang glider pilots are restoring more old film of the early days while it is still there to be rescued. Unsurprisingly, the quality of the results varies. 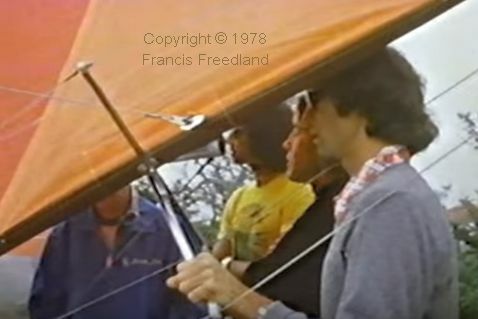 1978 Pico Peak International Hang Gliding Meet by Francis Freedland is about the best I have seen. Jean-Michel Bernasconi died of a stroke on April 2nd, 2016. For some clearer photos of the Delta Wing Phoenix Mariah, see the Hang glider PHOENIX MARIAH page on Delta Club 82. Click the photo to see more photos of this unique wing.